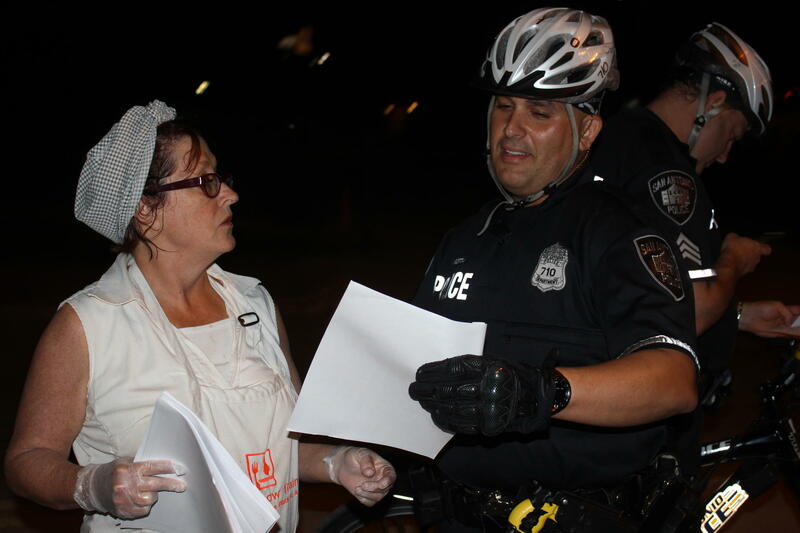 San Antonio Chef Joan Cheever receives a citation from the San Antonio Police for not have the proper permit while feeding the homeless. 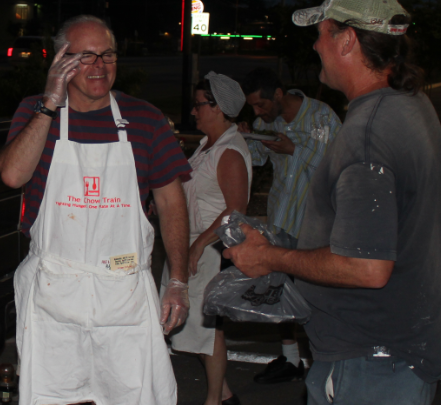 Every Tuesday night for the last 10 years Joan Cheever has come to Maverick Park, in downtown San Antonio to feed the homeless. But this past Tuesday something new happened. The police showed up. Cheever: He says we have to have a permit. We have a permit. We are a licensed non-profit food truck. Officer Mike Marrota: Licensed by who? Cheever: City of San Antonio. Officer Marrota: So do you have the permit? Officer Marrota: I’d like to see it. Officer Marrota: Thank you dear. Cheever: You’re welcome, you’re welcome. The documents are produced but there’s a problem. They are expired. But Cheever argues to Officer Marrota that the food truck, where the meals were prepared elsewhere, is in compliance with city health codes and properly permitted. And that food was transported to the park in commercial catering equipment, kept at proper temperatures and using standard food safety practices. Cheever: This comes up and I tell you guys and the mayor I have a legal right to do this. Officer Marrota: Legal right based on what? 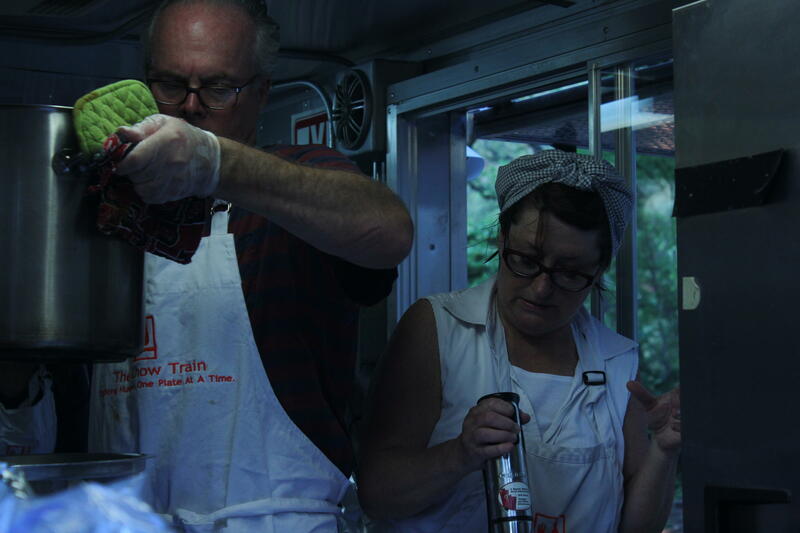 Chef Joan Cheever and her husband Dennis Quinn cooking in the Chow Train food truck. Cheever is claiming RFRA – Religious Freedom Restoration Act. That’s federal and state law that protects the free exercise of religion. Marrota shakes his head. He isn’t buying it. Officer Marrota: Do you have your driver’s license with you? Officer Marrota: Can I see it please? Officer Marrota: I’m going to issue you a citation. The five-foot tall Cheever isn’t backing down and looks incredulous as Marotta starts writing the ticket. Officer Marrota: So you can take it to court and tell the judge exactly what you are telling me. Cheever: So what’s the citation for? Officer Marrota: For serving – people – without a permit. You are not allowed to serve. That is the city of San Antonio. Cheever: Do Good Samaritans get tickets in San Antonio? 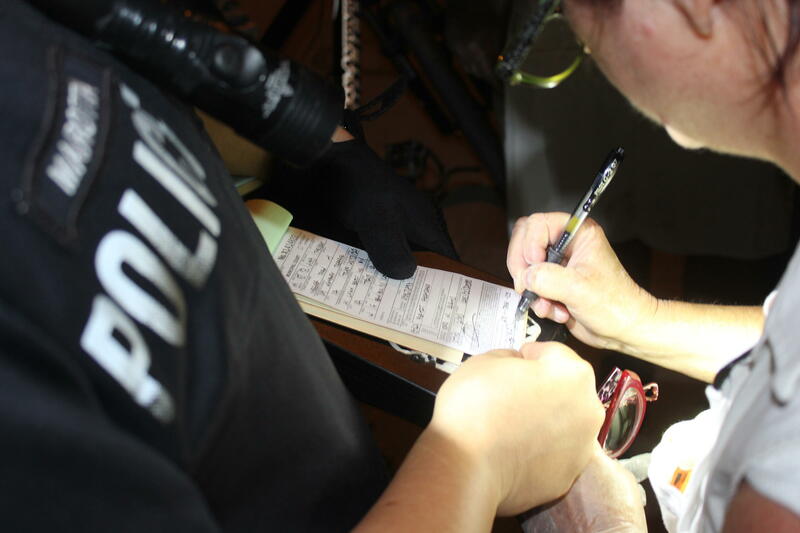 Chef Joan Cheever signs the citation for feeding the homeless without a permit. And even as the ticket is being written the serving of the food continues. Officer Marrota: You can serve them. That’s fine. Officer Marrota: You have them in line. I’m not going to not allow you. Officer Marrota: Go ahead. Let them eat. This was the fourth serving stop for the Chow Train that night. At each stop the men and women in need like Gary wait for her. “We love Tuesday nights because we know we are going to get something good to eat,” he said. 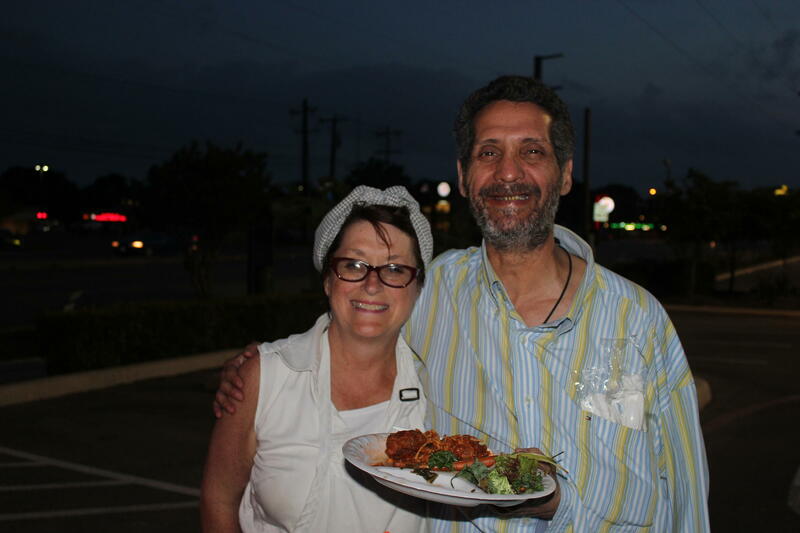 The menu for the night is restaurant quality, including farm fresh vegetable soup, lamb meatballs over whole wheat pasta, southern brazed greens and farmer’s green salad with roasted beets. Cheever has also taken the Chow Train to areas around the country hit by natural disasters, like when deadly tornados hit Joplin, Missouri and Moore Oklahoma and when wild fires consumed Bastrop Texas. Cheever’s Good Samaritan culinary efforts caught the eye of cooking guru Rachael Ray and was invited on her television show last November. 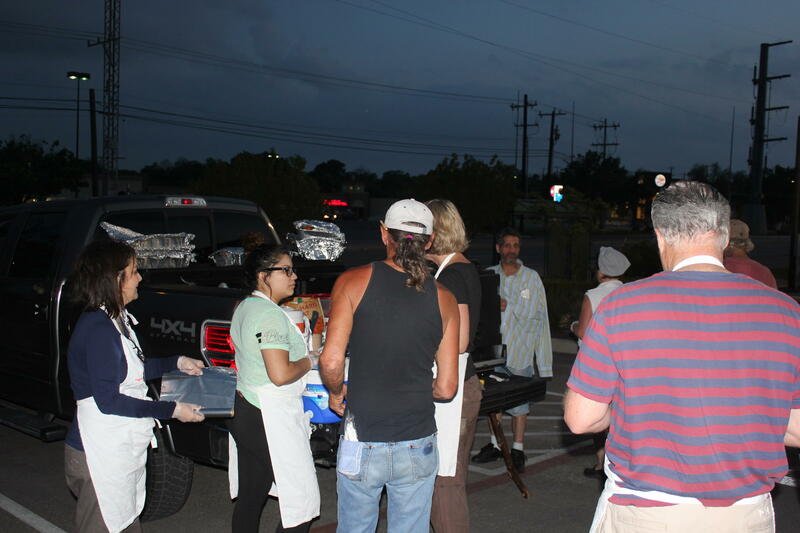 Homeless gather around the Chow Trains' truck for a hot meal. But Cheever’s next audience may not be so uplifting. She’s due in court on June 23rd and she says she’s going to fight the citation. Meanwhile Cheever says she’s not stopping. On Tuesday, you can find her again at Maverick Park feeding the homeless, and according to police--breaking the law. 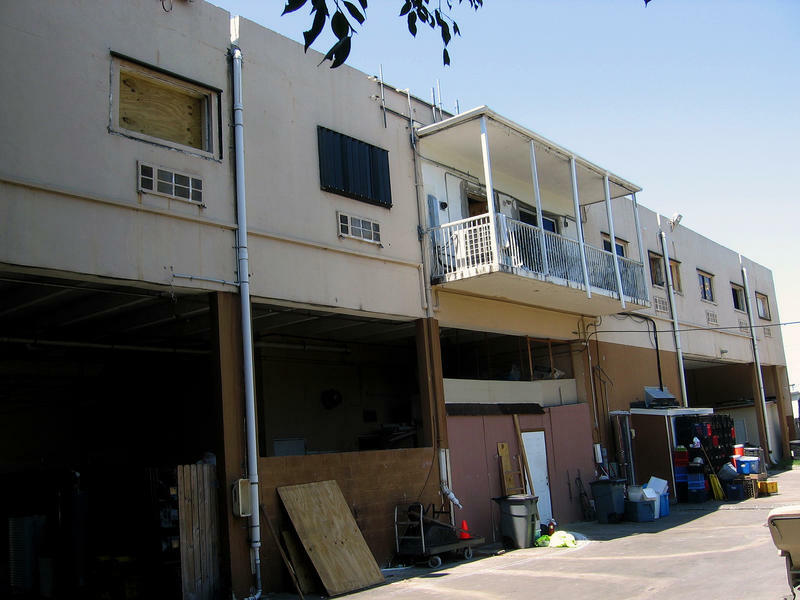 It's been a week of goodbyes at the Homeless Voice in Hollywood, Fla. For nearly 13 years, this rundown, 22-room hotel operated as a homeless shelter. On most nights, hotel manager Christine Jordan says, more than 200 homeless men and women stayed here, some sleeping on mats in the cafeteria. "We called this the emergency level ... almost 40 people in here every night," she says. Some stayed for free and others paid on a sliding scale. "[Now], everything's gone. I can't cry anymore."